Most of you know that I have been raising money to improve the school lunches in the village of Peredo for this school year. Also to provide breakfast 2 days a week. With the help of churches in the Newark area and Licking Valley High School, we are giving the kids a variety of foods with much needed vitamins they do not receive in their diets at home. I want to add also that most of the money was raised while I was here in Haiti so a big thanks to everyone back in Ohio who led these fundraising projects. This would not be possible without you. It always amazes me how people who have never been here, never seen the kids in their cute uniforms, never played with them at recess-will still step forward and help them. I just provided the facts and the needs and then you all "went to town!" The enrollment is 165 kids this year! 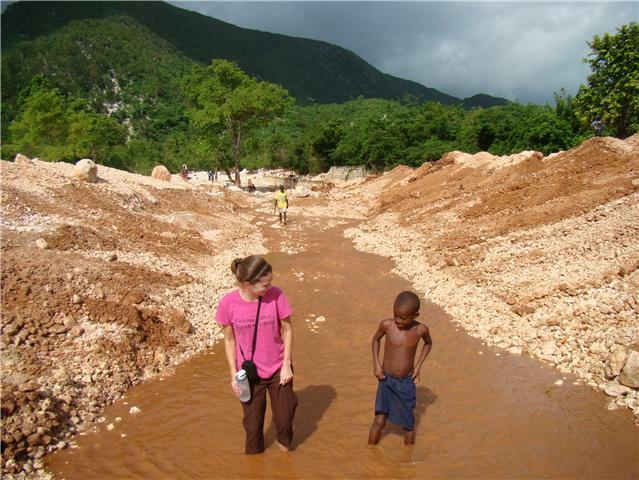 A big change from when I came to Haiti 2 years ago and there were about 60 kids. I had a meeting with the principal and school teachers discussing how the school kids were always sick and we talked about causes. One they came up with is the kids are dirty. As in, they don't have a way to wash their hands after using the outhouse at the school. I thought, "SCORE!" People ARE listening to the heath teachings in the village. So they made a handwashing station outside the outhouse with a bucket of water, a bowl to dip into the bucket to wash their hands and soap. This is moved from class to class to wash before lunch too. I didn't get a picture of it-but I will and post later. Also we talked about the water the kids are bringing to school to drink in old pop bottles and containers they find. We have a large igloo drink container that we have here when teams come to work in Haiti. All the other times it was just sitting here at the mission house. So I gave it to them to use for the kids. They bring water from the well right outside the camp property for the kids to drink. Twice a week the kids get a kool-aid type mix with Vit-C in it with the money raised for the food programs. Once we get the food program going smoothly we are going to start making fresh squeezed juice for the kids the mornings they get breakfast. I have kinda spun the cafeteria ladies around with the changes so far so I am giving them time before I add something else! Here are some pics of a lunch last week. It was rice and legumes. Which is rice and a bunch of vegetables all cooked down together with spices and oil. It is my favorite Haitian dish and has tons of vitamins in it. It has spinach, carrots, potatoes, onions, peppers and cabbage. I know it doesn't sound good but it is! The kids love it. More school lunch pictures to come courtesy of me! More bellies full of nutritious school lunches and breakfast courtesy of you! Thanks so much. You truly are helping make a difference in these children's lives.